ZWOLLE – Ok, maybe the second annual Association of Louisiana Bass Clubs State High School Bass Fishing Championship doesn’t need to take any baby steps. Friday afternoon at the event’s weigh-in it was evident this fledgling tournament has definitely leaped past the baby step stage and gone straight into a dead sprint. On hand were 19 teams, 102 anglers representing 13 high schools. 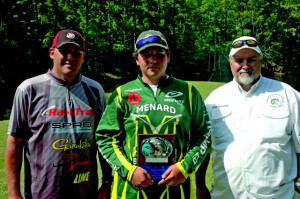 The numbers are pretty impressive considering a year ago there were only seven teams, 37 anglers representing five high schools in the inaugural tournament. In just its second year of existence, the tournament has made a huge leap forward in both attendance and popularity. “I’m definitely encouraged by the numbers,” said Craig Lewis, tournament director. “I am thoroughly impressed with today’s turnout and I believe these numbers are only going to grow as word continues to spread. Lewis said bass clubs are perfect for all those kids that don’t play football, basketball or baseball but want to compete in a high school sport. While Lewis has spent a lot of time promoting these bass clubs to the schools, the kids themselves have taken over spreading the word. 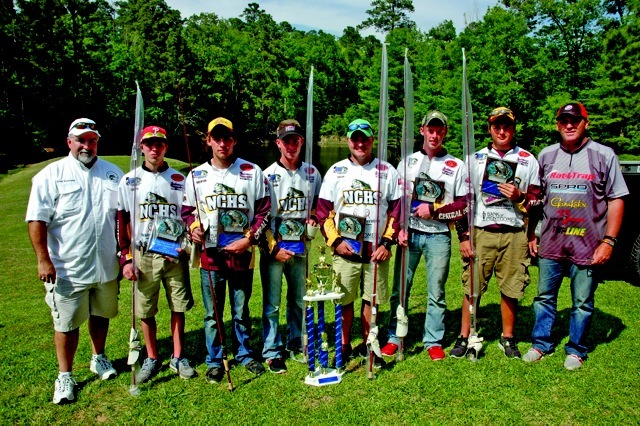 Natchitoches Central Team 1, which was second last year, captured the championship by weighing an impressive 12-fish, 33.18 pound bag of bass, 3.5 pounds better than Pineville High School Team 1, who finished with 29.64 pounds. “We spread out. One team fished the San Miguel flats (Patroon Bayou) and the other two teams went south,” said NCHS team captain John Linger. “The two teams who went south ran into a number of Elite Series fishermen who were fishing in the Bassmaster Elite Series out Cypress Bend. Teammate Brenton Lester, who caught the biggest bass amongst the three boats, said he was using a 5X crank bait when he snagged a big female bass. And the bass almost succeeded as it gave Lester a run for his money before he was finally able to get his prize into the boat with the help of his partner. “It got my line tangled up in the trolling motor, went under the boat and shot to the back of the boat. It took me almost six minutes before Nick (Nicholas Wiggins) was finally able to lip it and get it into the boat,” Lester said. Oak Hill (29.45), Tioga High School Team 1 (28.31), Natchitoches Central Team 2 (28.18), North DeSoto Team 1 (27.48), Grant High School Team 1 (26.54), Alexandria Senior High (25.87), Montgomery Team 1 (25.19) and Grant High Team 2 (25.11). Heading up the second group was Northwood (25.09), Buckeye (24.01), Menard Team 1 (21.95), Menard Team 2 (17.39), Tioga Team 2 (12.38), North DeSoto Team 2 (11.36), Pineville Team 2 (10.78), Montgomery Team 2 (8.80) and Glenmora. The competition for Big Bass was equally tight as Menard’s Ashton Futrell took the honor by just one-hundreth of an ounce. The second biggest bass of the tournament was caught by a member of Tioga’s Team 1. Futrell’s 5.44-pound lunker came as somewhat of a surprise to the 15-year-old. Futrell, who was fishing on the Texas side in five to six feet of water, knew it was a good fish as soon as he set the hook. Menard’s Ashton Futrell captured Big Bass honors at the 2nd annual Association of Louisiana Bass Clubs State High School Bass Fishing Championship at Toledo Bend. Futrell’s bass weighed 5.44 pounds, a tenth of an ounce better than one caught by a member of Tioga High School’s Team 1. 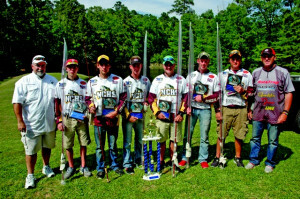 Natchitoches Central High School’s Team 1 won the 2nd annual Association of Louisiana Bass Clubs State High School Bass Fishing Championship at Toledo Bend with a 12-fish limit weighing 33.18 pounds. It was 3.5 pounds better than Pineville’s Team 1. Members of the winning team were (from left) ALBC President Elray Boudreaux, Dustin Howell, Brenton Lester, John Linger, Logan Anderson, Josh Linger, Nick Wiggins and tournament director Craig Lewis. NCHS Team 1 finished second in last year’s inaugural tournament.